December provided some much needed family time as Becky came home from Cardiff and we all congregated at granny’s for Christmas day. With a couple of other close friends, we enjoyed a traditionally low-key Christmas – although Becky and I did get royally beaten by our elders at the humorous card game “What Do You Meme”! 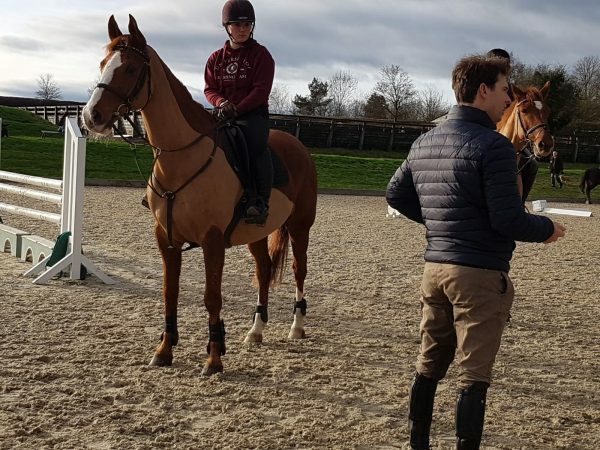 The horses also had a couple of days off before restarting work on boxing day with a hack around the local village, and have since settled into varying degrees of winter work. 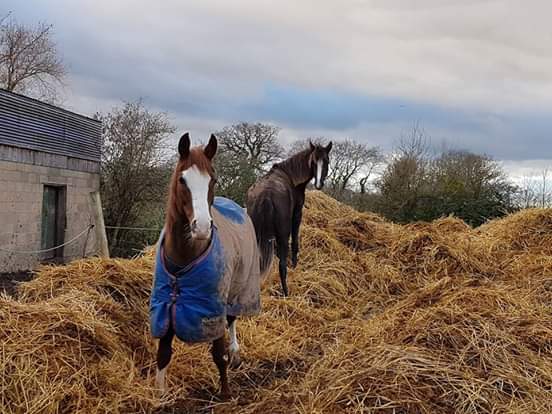 As I go back to University in mid-January, I’m making the most of being home but this does mean that the horses don’t get standard holidays, rather quiet weeks during term time. 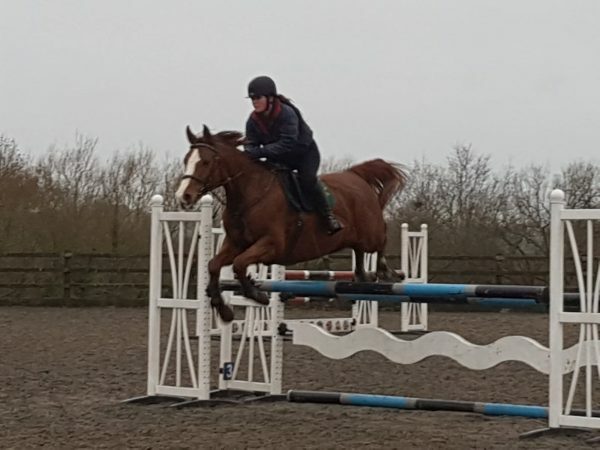 Avonbrook Odin (Marcus Aurelius x April) is positively flying after his Summer off and the highlight of our month was attending a showjumping clinic with none other than Harry Meade. Odin, of course, performed impeccably and received some fantastic praise from Mr Meade – who is a rather legendary event rider here in England. Although we weren’t jumping big, we practiced technical and cognitively demanding exercises involving 45, 90, and 135 degree turns, pats with the inside hand – while shouting them at Harry – and remembering an overly long course with several almost repeating patterns. Cognitive overloading at its finest and Harry Meade certainly disproved my ‘don’t meet your heroes’ fear. 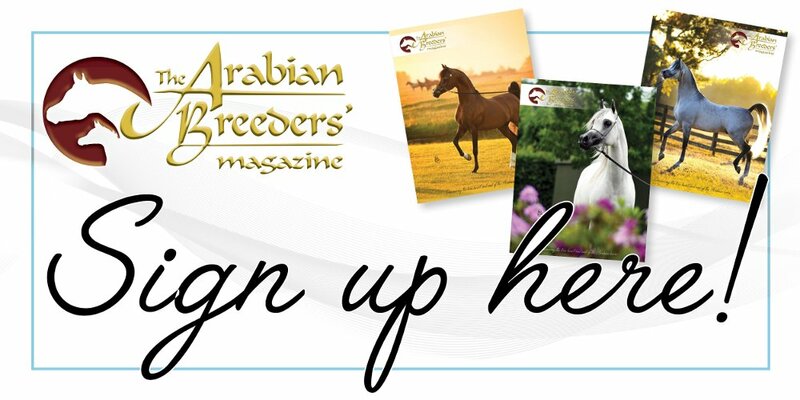 Annia Aurelia (Marcus Aurelius x Bint Zaehaebi) – Penny – has also started the year as she means to go on. So changed from 2018’s show horse, our Princess has developed some real strength and is able to ‘sit’ and reach into the bridle on the loosest contact. I really cannot wait for the 2019 show season, I’ve got some great shows lined up for her and I’m looking forward to getting her back on the circuit. In order to help her strengthen up while providing some entertainment, we’ve been jumping some bigger fences and ‘bounce grids’ under the watchful eye of our trainer Erica Watson. Penny does so love her ‘Auntie Erica’ and is forever making a liar out of me when I tell Erica about how she’s “strong into a fence” or “taking the wrong lead in canter for fun” – she’s a madam and saves her little tricks for when no-one else can see them in order to make me seem delusional! Her jumping confidence and capability is ever-growing and – to let her show off her skills – we took her to Allens Hill for their end of year team showjumping competition. Worcester and District Riding Club, of which I am a member, fielded several teams in the various heights available. Penny jumped a fantastic double clear in the 80cm and helped her team to 6th place, which was fantastic but I was more impressed with her fluency and consistency over a challenging course. Super-sire Marcus Aurelius (Aurelian x Fiesta Magica) was substituted into another of WDRC’s 80cm teams the night before the competition after another competitor was unable to participate. After warming up with a couple of pony clubbers and joining in with their ‘Chase Me Charlie’ – while bucking and leaping about, persuading them to dump their ponies in favour of the much more entertaining Arabian – Marcus swaggered into the arena with heaps of pressure to jump clear and no inclination to listen to anyone except his jockey… Arguably… After riding like an overprotective parent to the first three fences, I finally let him settle into his own rhythm for the rest of the course. Luckily for me, he kept all the fences up. Unluckily for me, the only way to keep him clean at 80cm is to dare him to every fence which does involve a lot of galloping and some very, very tight turns. 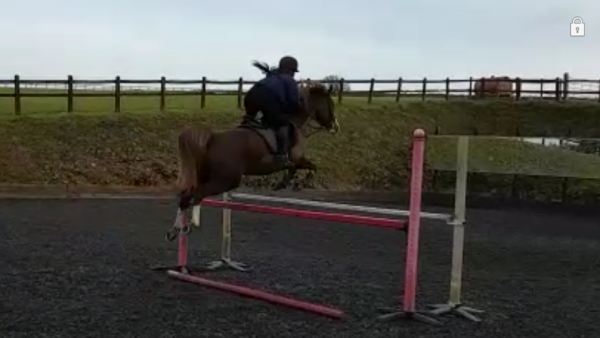 My friends have often joked that I’m useless in a jump off, I’m not much of a risk taker and I tend to try for a double clear than a top placing. On that day, however, those friends may have eaten their words. Marcus is not a horse that can be pulled around in the “kick, turn, kick, turn” style that dominates the pony ranks so every line, every turn, every stride had to be calculated and executed in a manner that didn’t offend His Lordship. I only wish there was video evidence of the round as it certainly felt to be the very definition of calculated risk, good enough for individual 6th from over 40 starters that included whizzy ponies, ex-racers, and serious risk-takers. After finishing his round, he maintained the ‘snort and blow’ just long enough to consolidate his place at the top of the pecking order before sighing deeply and ambling back to the lorry with his long-suffering daughter in tow. There are no words to describe how much I love this stallion and how much he makes me laugh. Another Marcus-moment that I wish I had filmed was jumping a mini-puissance at home and finishing over a very respectable 1.13 (3 foot 7 inches) upright which caused me to whoop with delight upon landing. The calm but forward approach, the casual height he gave it, the lack of any issue from his steep landing all point towards the obvious; Marcus isn’t ready to step down just yet! PS Ibn Aurelius (Marcus Aurelius x PS Silvern Silk) is also developing into a rather nice young horse. Here at Avonbrook Stud while his owner is recovering from a broken leg, ‘Rory’ is receiving an education and is proving to be an affectionate, keen, willing 5 – now 6 – year old. 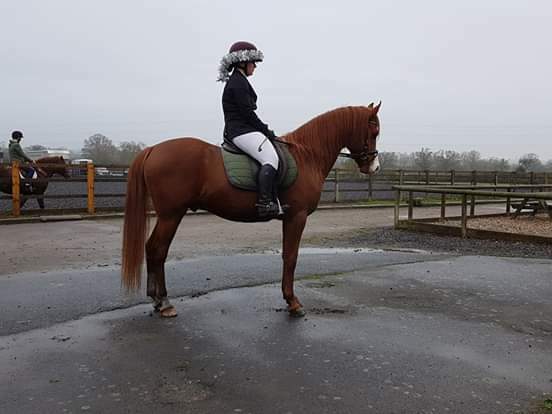 As well as brushing up on his flatwork, Rory has learned to jump and we took him for his first two outings this december. First up was accompanying his father, and brother Odin to clear round showjumping where he worked on the flat in a big, unfamiliar arena with no problems and stood to watch his father careen around the course afterwards. We then took Marcus and Rory to Gracelands Equestrian Centre for their Christmas showjumping competition where Rory jumped bravely in the 50cm and 60cm classes – even finishing 6th in the 50cm. Horse of the Year Show commentator John Stoakes, who regularly features at Gracelands and provided the commentary for my sister and I growing up competing there, now knows Rory’s name ready for HOYS – all in good time of course… It was fantastic to see Fran, Rory’s owner, come to watch and I hope she enjoyed watching his progression as much as I’m enjoying riding him. Sadly, the holidays were not all horses and Christmas for this student. Post-Christmas exams are looming and revision currently dominates my waking hours that are not spent up the barn. However, even my all important revision has recently taken a back seat to my first attempt at officially organising an awards dinner for my local Endurance group, for which I am on the committee. It is a fantastic combination of stress, excitement, and the sense of power that comes with such responsibility. With only a couple of weeks to go at the time of writing, everything’s ordered and organised, we have some very generous raffle prize donors and the majority of trophies have been returned or are being brought back on the night. I cannot imagine the level of stress that a show organiser or any other such person with so many balls to juggle experiences, but this taste is quite enough to remind me how lucky I am not to be the one ‘calling the shots’ at a show and going through all the effort to make something happen just to be complained at. I am very lucky and enjoying the support from my fellow committee members as well as all of the guests and staff at the venue, but I sure am glad not to be organising anything else for a while! Here’s to a happy, healthy 2019 and anything beyond that is a blessing! Now to begrudgingly shove the tree and decorations back in the loft….